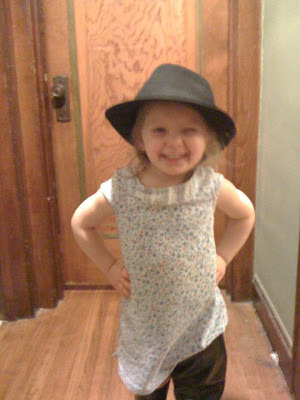 She calls this hat her "model hat"
Well isn't she just a cutey! 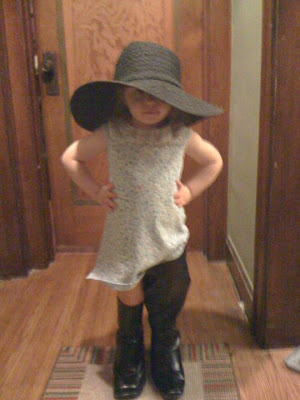 I have just introduced my grand daughter to the world of dress-up, my daughter really isn't on board with this yet. So at grama's house we do dress-up, and the fun we have, and why did I hold on to all these clothes, haha. Well it must be for dress-up and make believe with my grand daughter. what a cutie patootie! I remember wearing my mom's shoes all over and Daisy is already sticking ours in her mouth so I'm sure she will be a fan of wearing them when she figures it out;0. Your baked goodies are beautiful and look delicious. Daisy's BD is coming up fast! I think I'm probably going to bake everything to keep cost down since we are poor (sort of joking of course) on one income but, I will keep you in mind for future celebrations!! The cookies look uh mazing! Casey- I want to send some cookies as a gift! Along with that Chazown book I received to review!